What if the player is in fact the Jackal? Nobody knows his true identity, all the cutscenes where he shows up the only person present is the player himself and he always disappears without being seen. They supposedly send you to kill a man who you turn into throughout the game; a mysterious mercenary who is arming and helping both factions, and isn't that what you do the entire game in order to find him? When you're sent to prison, you destroy a weak concrete wall, then you kill everybody. Later on the game you meet the Jackal on the same prison, but there's nobody alive, the prison is in the exact condition you left it, but more importantly if you go check that concrete wall you destroyed is magically "whole" again, as if it had never happened. At the end of the game, the last time you meet him, on the table where he leaves the battery and the diamonds, there's a flare gun which he could have used for blowing up the dynamite. What if the player is just the dark side of the Jackal, and he sends him to die in this two possible endings? For me this is just a mercenary version of Fight Club, which makes a lot more sense than a plain contract killer who goes out of purpose and then realizes he's bad enough to commit suicide﻿. In Far Cry 2, the player plays a mercenary in a central African country. He's probably responsible for a number of atrocities, as he doesn't have much problem killing hundreds of men to get at his goal – which is to kill The Jackal. The Jackal is an arms dealer, who's arming both sides of the conflict in this country to achieve his final goal – destruction of both sides. He's the only character in the game who understands that the war must be ended. He's not the antagonist of the story, but a minor character. The Jackal understands that the only way to end the fighting and allow the civilians of the country to escape, is for good is for both sides to destroy each other. This means all mercenaries fighting in the war must die as well – and that includes the player, the player's friends, and the Jackal. War-tired and disgusted at himself, the only way the protagonist can cope with everything he's done is by creating a split-personality and allowing that to act as his conscience. That personality is The Jackal – he knows what to do and how to do it. This explains why when the Jackal appears to the player, they're alone together. Every time. No one else seems to care about the Jackal, talk about him, or act against him in any way. What does the Jackal do to this person who was sent to kill him? Give him lectures on morality, quote Nietzsche, and explain how it must all be ended. In the end, the player must murder all of his mercenary buddies, urged on by the Jackal. Keep in mind, by this point in time the player character has had many opportunities to kill the Jackal, but has chosen to follow him in his plan instead. They meet together one last time after herding the civilians through a mountain pass to the border of another country. The Jackal gives the player a choice: detonate the explosives, causing the mountain pass to collapse and trapping the feuding warlords in a country with no civilians. Or bring a substantial amount of money to the border to bribe the guards to let the civilians flee to safety. Both options will end in death: the explosives will kill whoever detonates them, and whoever hands in the money will have to commit suicide to end it "for good". Everyone involved in perpetuating the war (including the player and the Jackal) are a cancer, as explained by the Jackal. The Jackal will do whatever the player chooses not to do, thus ensuring they both die. So, no matter what the player chooses, he dies at the end of the game. Yet, during the final cutscene, it's explained The Jackal's body was never found. The player commits suicide and ultimately completes his final goal. © Post "Far Cry 2 is a mercenary version of the Fight Club. The player IS the Jackal." 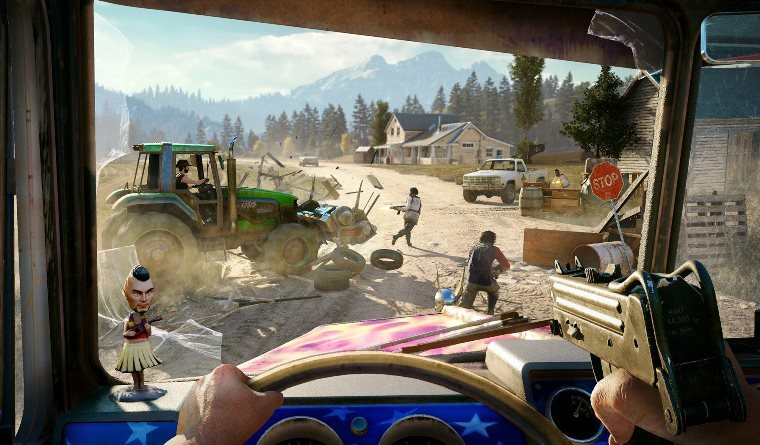 for game Far Cry 5.